Recipe Copyright © 2000 Kasma Loha-unchit. Be sure to read Kasma's Congee Article. Place soup stock ingredients in a large pot and bring to a boil. Reduce heat and simmer 30-40 minutes. 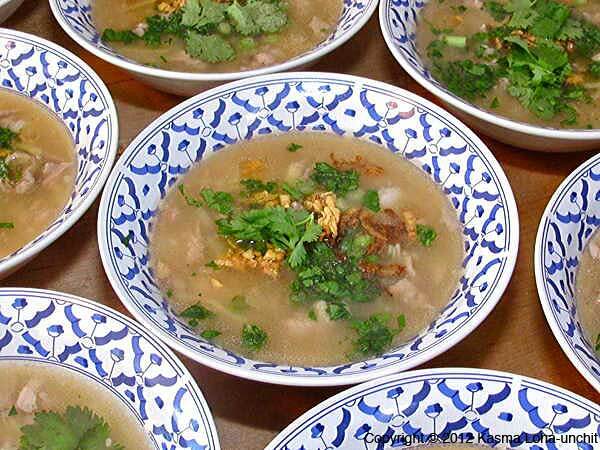 Combine the ground pork with the white pepper, minced garlic and cilantro roots (or stems), and fish sauce. Mix well and set aside. Rinse the rice a few times. Place in a pot, add 3 cups of water and bring to a boil. Lower heat and simmer partially covered, skimming off any foam that forms over the water. Cook until rice has softened and the grains have started to fall apart. In the meantime, prepare the remaining ingredients. In a small skillet, fry 1/2 cup of the slivered ginger in hot oil over medium heat until browned and crisped. Drain with a fine wire-mesh skimmer. Return oil to skillet and fry the chopped garlic in it. When golden brown, remove from heat, leaving the garlic pieces in the oil. 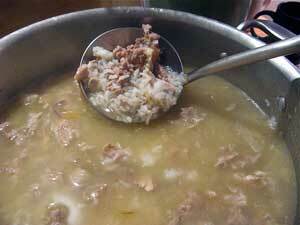 When the stock is ready, drop the flavored pork mixture by the teaspoonful into the soup. Return to a boil, then simmer about 10 minutes. Season to taste with light soy sauce and fish sauce. 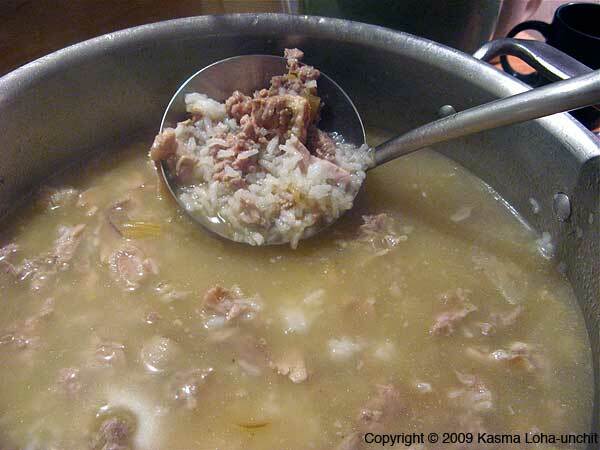 Just before serving, add the hot broth with pork chunks to the cooked rice to make a soupy rice mixture. Heat together a few minutes. Stir in the fresh slivered ginger and green onions. Dish into individual serving bowls. Top with a dash of ground white pepper, some garlic oil with garlic pieces, a little fried ginger and cilantro sprigs. Continue on to Kasma's Rice Congee article. Kasma teaches this recipe in the Evening Series Advanced Set H-3. *Because the Thai language has its own script, there are different ways of transliterating Thai into English. 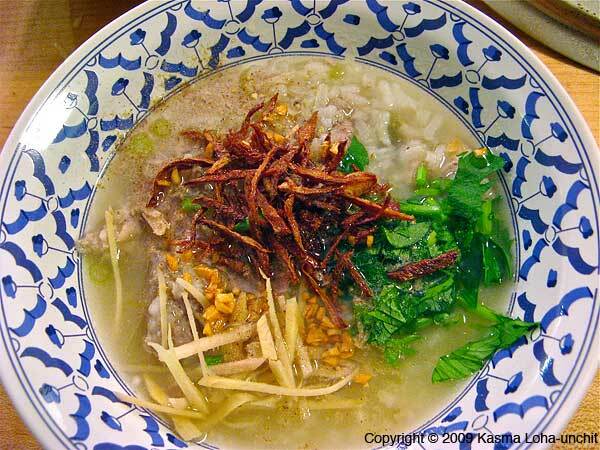 The more phonetic version is Kao Dtom Moo; the more usual spelling is Khao Tom Moo. See A Note on Thai Pronunciation and Spelling. Copyright © 2000 Kasma Loha-unchit. All rights reserved.